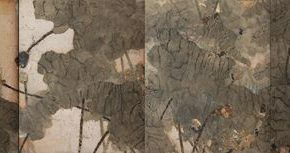 On March 26, 2017, “Isolating Dust: Yu Yue’s Exhibition of Work” opened in the 798 ICI LABAS, presenting a series of ink works recently created by the artist, including “World of Lotus”, “Out of the World”, “Sketch in Jinzhong”, as well as the more than 5-meter-long work entitled “Firelight” in mixed media including all chromatic silver foil, ink, hemp paper as mediums. 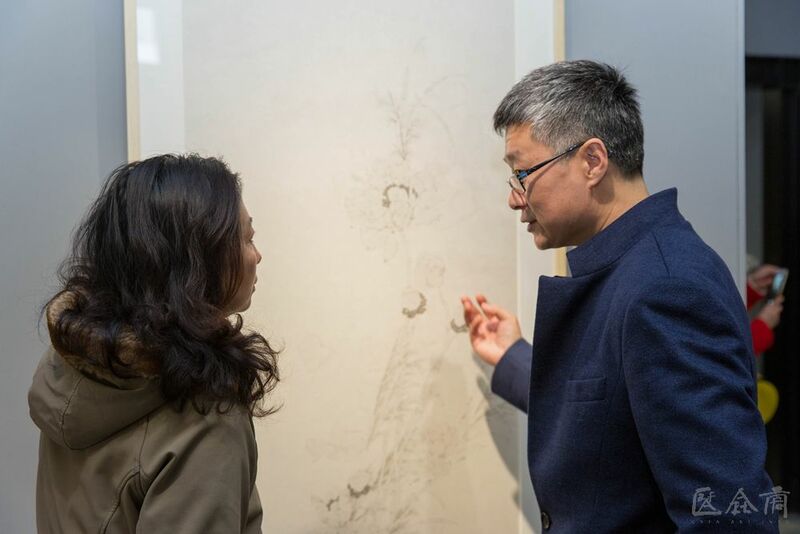 Yu Yang, Director of the Research Center for Chinese Painting at CAFA, serves as the curator, for the interpretation of the works by Yu Yue, Yu Yang said that “Isolating Dust” perfectly presented the interest and true meaning of the works by Yu Yue. “Isolating” means the interception and separation, taking the initiative to push art away, isolate and shield it, but it is distant to the reality, and also implies an interesting self-consciousness and self-adaptation. “Isolating Dust” is also the wisdom of choice and circumvention of the artist. 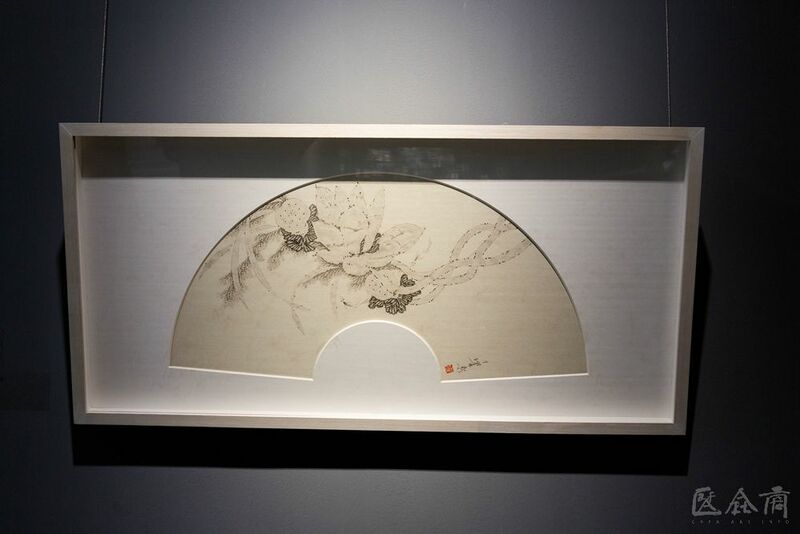 After the opening of the exhibition, the organizer invited a large number of artists that use calligraphy and painting, as well as art critics for a discussion on the creation of the artist and the extended ontological topics. Yu Yue graduated from Hu Wei’s studio at the School of Chinese Painting, CAFA, and Hu Wei affirmed the contemporary expression of the creation by Yu Yue from the perspective of “materials and techniques”, the atmosphere of the screen created a smooth and stable sense, where the audience can learn the state of mind of the artist. Prof. Shao Yiyang from the Central Academy of Fine Arts said that the elegance of the paintings by Yu Yue was distant from the reality that was presented as the beauty of “looking at flowers in fog”, the contemporary pursued subversion, but Chinese painting could not completely subvert the tradition, Yu Yue’s creation grew out of the classical, both combining the freehand artistic conception and meticulous elegance. At the same time, “Isolating Dust” is also a metaphor of a reflection on keeping materialism at a distant. 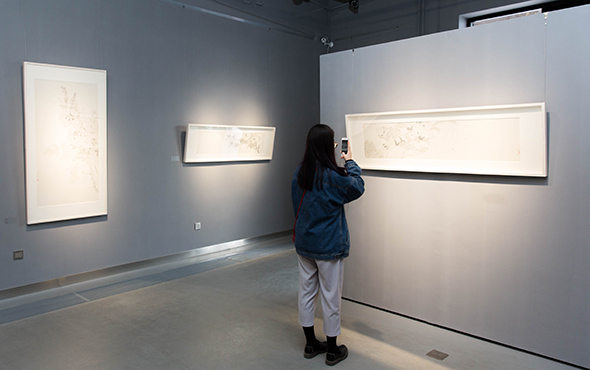 Prof. Cao Qinghui is concerned about the aesthetics of form on the screen, to analyze the construction of the relationship between the dots, lines, and surfaces. Artistic creation is a way for a cultural group to observe the relationship between self-mind, the individual and society, and also to always express their own clear answer, and especially in the creation of literati painting, always showcasing a state of facing the world, and the obvious reflection, which are both the expression of the artist’s own experiences and the external manifestation of the style of the artist’s language. 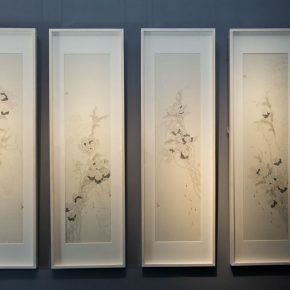 “Isolating Dust” is a summary and expression of the artistic concept of Yu Yue. 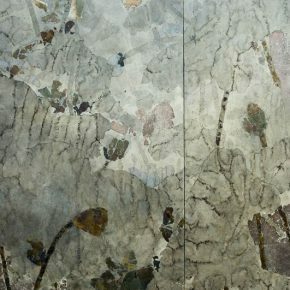 Seen from recent creations, you can see the evolution of the theme and style of the artist, the lotus series was named “World of Lotus”, which implies boundaries and territories, and also highlights the reflection on earthly relations. 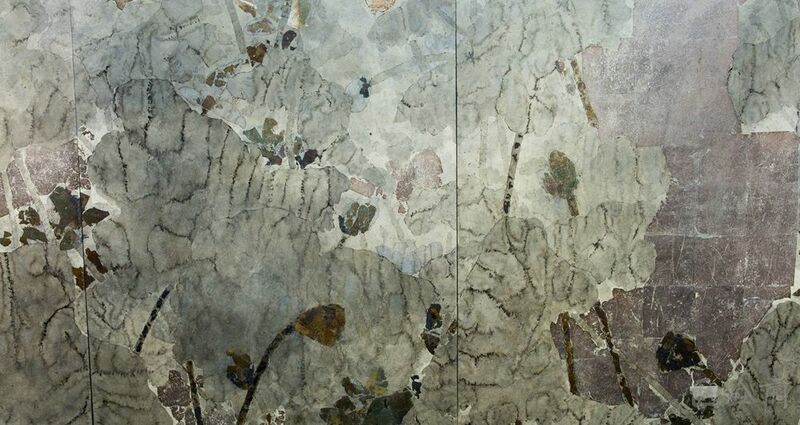 The work of mixed media “Firelight” is like the lotus be quenched in an high temperature, with mottled rust, while it also reflects the depth of the exploration in the material language. The series of landscape paintings entitled “Sketch in Jinzhong” mainly focuses on the details of mountains and rocks, through the fine and subtle wrinkling and rubbing skills to present a close touch with a sense of the “quality of mountains”, and also giving the landscape painting a personal taste. The exhibition remains on view till April 16.